The next generation of mineral make-up. This amazing mineral make up goes on like velvet! No fillers. Covers beautifly & feather light! We carry a HUGE range of foundation colors for EXACT matching. 50+ eye shadow colors, (shimmers or mattes), 16 beautiful blush colors!! Since 1976, Bare Escentuals has focused on using only the finest ingredients in our products. This commitment led to the creation of our revolutionary mineral makeup called bareMinerals®. Made with crushed minerals from the earth, 100% pure bareMinerals are free of preservatives, talc, oil, fragrance and other potential skin irritants. All ages and skin types can benefit from our feather-light 100% pure bareMinerals, but especially those concerned with skin sensitivities, allergies, scars, blemishes, rosacea, wrinkles and pigmentation. 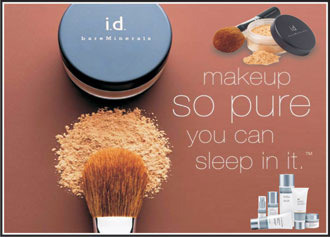 "Bare Minerals, make up so pure you can sleep in it"
We now carry the full line of "READY TO GO" PRESSED MINERALS from Bare Escentuals. Of course, we offer FREE color matching & makeup application! 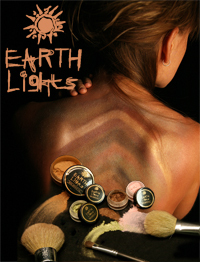 HOT NEW SHADES FROM EARTHLIGHTS! FULL SIZE foundations, shadows & blushes! We have added fabulous new colors to our line of 50+ shades! UPTIGHT CAN BE A GOOD THING! FIRM, TIGHTEN & LIFT SAGGING SKIN! Now Available! "Re-Genesis" Enzyme Lift." Stimulate NEW collagen production... Passion Fruit Enzymes create a warming "thermal" reaction to tighten and firm mature & stressed complexions! DAILY USE OF ANTI-AGING PRODUCTS IS A MUST TO ACHIEVE DRAMATIC & LASTING RESULTS! Copyright © 2019 The dermalclinic.com Site Map site design :: iSelect iSelect Internet provides Website design, hosting and programming.